Crispy bacon, mushroom and onion pizza with home-made dough and the ultimate steak salad with charred vine tomatoes and cream goat’s cheese. 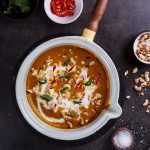 As the warmth of Summer gives way to the chilly days of autumn, many people hang up their braai tongs and pack away the charcoal in anticipation of more time spent indoors. I’m here to tell you that, that simply isn’t necessary. 1) Us South Africans have it pretty good when it comes to Winter. Of course it’s cold and if you’re in Cape Town, wet, but we don’t have to worry about blizzards and temperatures in the extreme minuses. We can, some days, be outdoors and 2) Braais are not just for chops and wors. 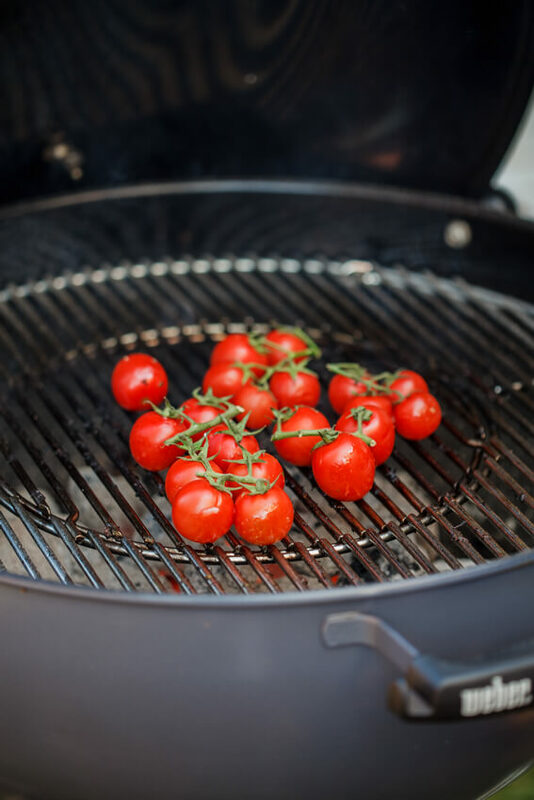 You can make a bevy of culinary delights on an open fire and that’s where our friends at #Weber come in. I can’t tell you how much my eyes have been opened since receiving our Weber braai. I have always loved cooking over fire but in the last few months, our braai has been used double the amount it normally would have been. 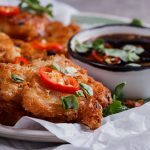 As the weather changes, you can exchange those crispy-fat lamb chops and succulent boerewors for curries, pizzas and sticky ribs. 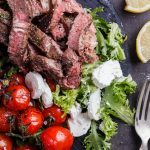 You can add smoky flavour to hearty vegetables and make chunky salads (steak salad more specifically) that will knock the doubt right out of any South African who feels chicken is a vegetable. So this weekend C and I decided to expand our grilling repertoire a bit further and for the first time, made a pizza using the awesome Weber Gourmet BBQ system pizza stone. You guys, it was the BEST pizza I have had in a long time. 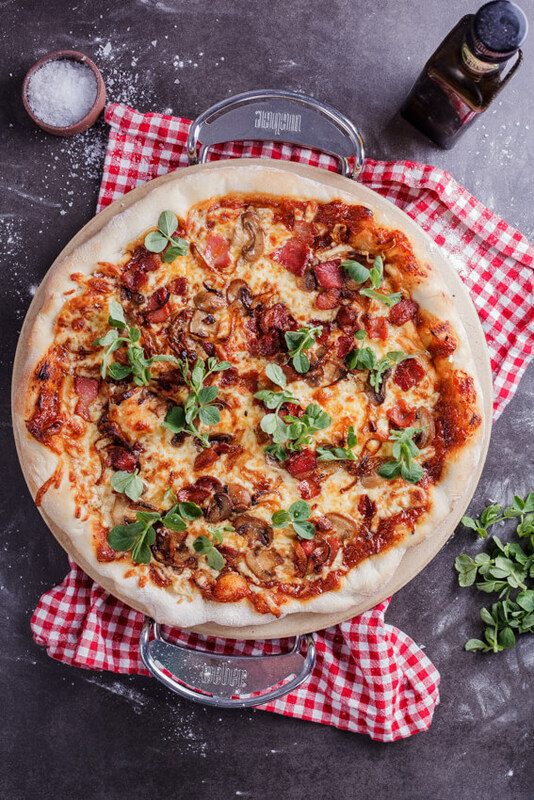 Not only is it possible to get the Weber to near-pizza oven temperatures but the stone is an excellent conductor of heat and so, your base will be perfectly crisp. 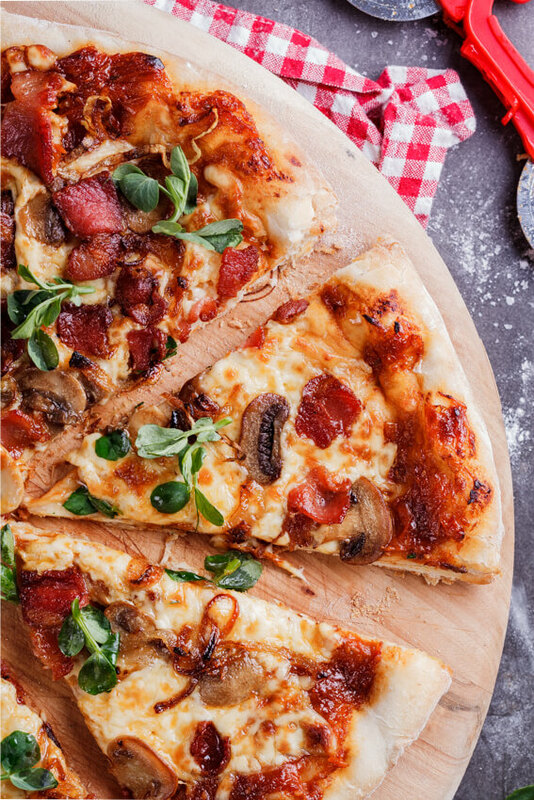 We added crispy bacon, garlicky mushrooms and crispy onions along with a slow-cooked cherry tomato and balsamic vinegar pizza sauce. It was mouth-wateringly delicious. Another recipe we played with was a really great, substantial and chunky steak salad. Which is, let me tell you, the best kind of salad there is. 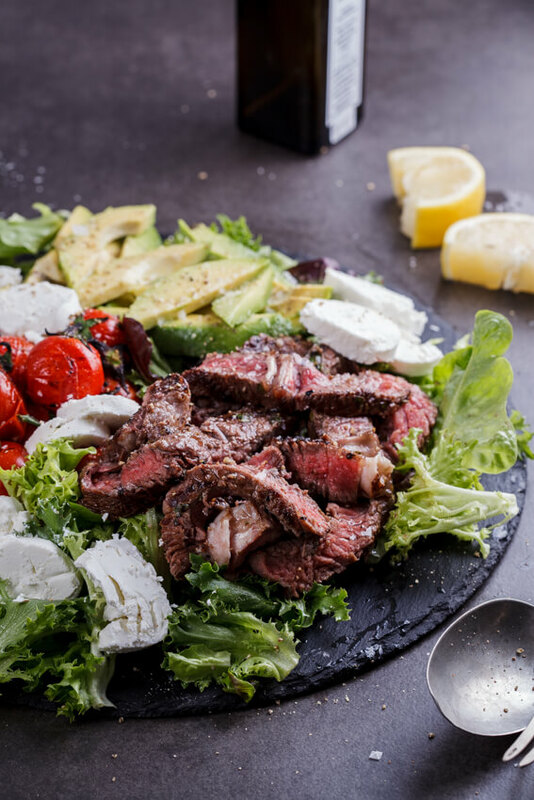 Slices of juicy, flavoursome steak on top of baby leaves (who are the lucky recipients of all those steak juices) along with creamy avocado and blistered baby tomatoes and chunks of goat’s cheese. Are you drooling yet? I love salads like these because even the meatiest of meat eaters can’t complain and even though they feel quite indulgent, are actually very healthy. 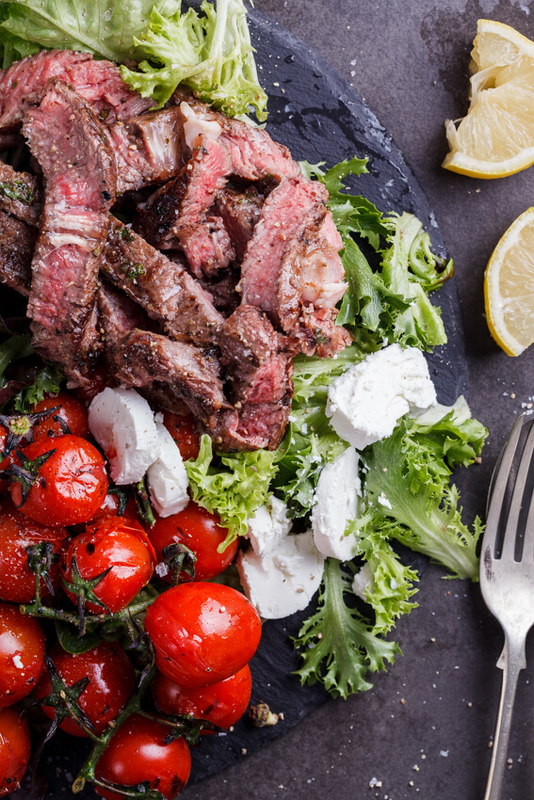 All hail the mighty steak salad! And if you’re still unsure about how to use your braai to its full potential, fear no more. The geniuses at Weber are hosting a Grill Academy (say whaaat?! ), which is like a braai cooking class, on the 10th of June in Randburg, Johannesburg and they have invited me along. If you’d like to join me, simply pop over to their website where you will get all the information about how to book etc. The first 15 people to book and pay using the promotional code : SIMPLYDELICIOUS will get a massive discount of R300 off per ticket. Expect all kinds of deliciousness and for your world to be rocked. This is going to be one awesome event. Just another reason why Weber is #bestinclass. To make the dough, combine the flour and salt in a large bowl. In a jug, mix the warm water with the yeast and sugar and allow to stand for 5 minutes. Pour the water and the olive oil into the flour and mix until you have a sticky dough. Turn out onto a floured surface and knead for 5-10 minutes until the dough is smooth. Place the dough in an oiled bowl and cover with clingfilm. Allow to rise for 1-2 hours until doubled in volume. When the dough is risen, knock it down and form 4-6 balls, depending on how large you want your pizza to be. At this stage you can freeze the dough balls, in freezing bags, for use at another time. Place the balls of dough on a floured tray and allow to rise for another hour. To make the sauce, saute the onion and garlic until soft and fragrant then add the remaining ingredients. Turn the heat down and allow to simmer gently for at least 30 minutes until the sauce is dark and reduced. Add the basil leaves and blend in a food processor. Set aside. To make the pizza, your fire needs to be quite hot. 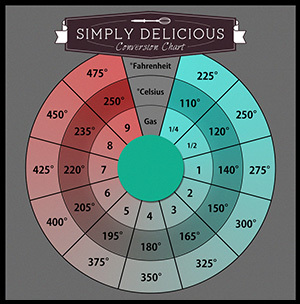 The temperature in your Weber needs to be at least 250°c. 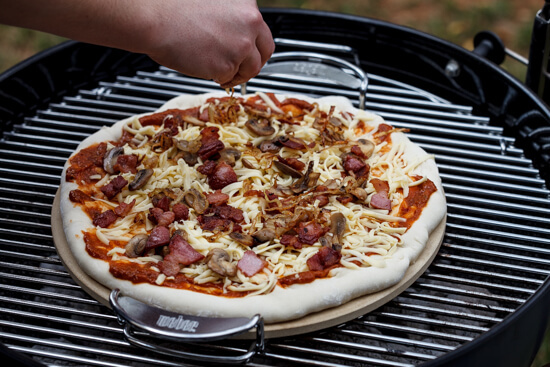 Place the pizza stone onto the grid in your Weber braai and allow to heat up. Roll out the dough into a rough circle then carefully place on the hot pizza stone. 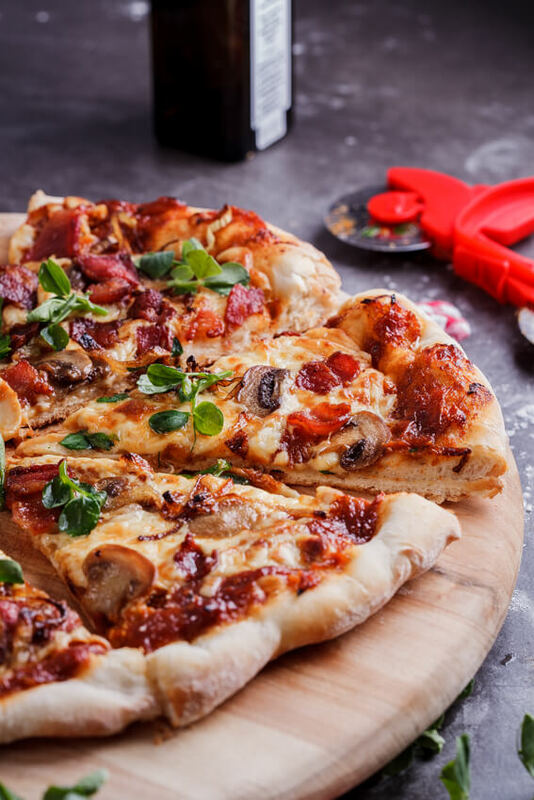 Swirl on the pizza sauce then top with the mozzarella, bacon, mushrooms and crispy onions. Close the Weber and allow the pizza to cook for 7-10 minutes until the base is crisp and golden brown and the cheese has melted. Carefully remove the pizza, slice and serve. To marinate the steak, combine the lemon juice and zest, olive oil, herbs and seasoning and marinate the steaks for at least 30 minutes. Braai the steak over hot coals until cooked to your preference. Remove the steak from the grid and allow to rest for at least 10 minutes, covered with foil. In the meantime, brush the tomatoes with olive oil and place on the braai. Allow them to soften slightly and for the skins to blister. Remove and set aside. 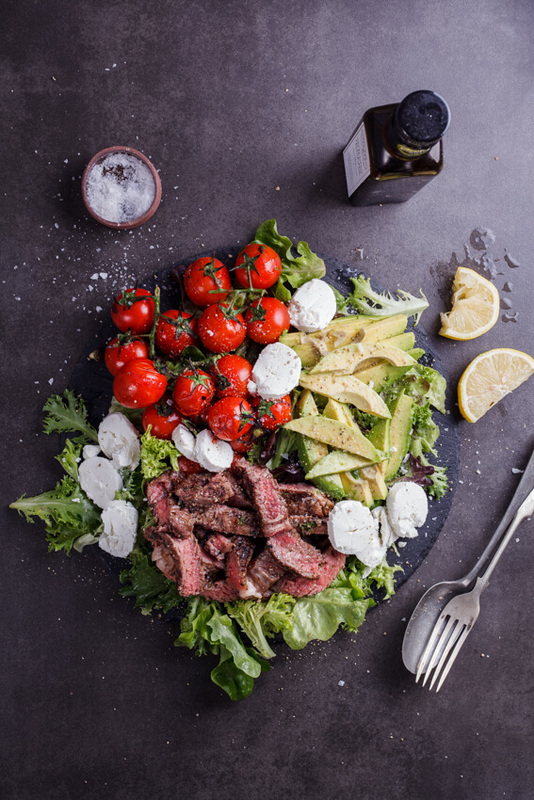 To serve, slice the steak into thin strips then place on the baby leaves along with the blistered tomatoes, sliced avocado and goat's cheese. Dress with lemon juice and olive oil, season to taste and serve. 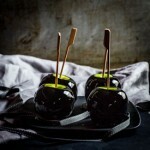 I recently came by your blog…..I must say that I have seen many recipe sites but few as interesting as yours. 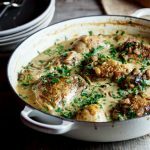 Keep up the great work ….and the appealing recipes. I like mostly Italian cuisine and I love pizza and lasagna and meatloaf….and Ukrainain foods and breads. Pizza and a steak salad? 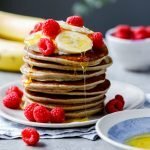 Sign me up ASAP and pass me a big fork 😉 It all looks so delicious and your pics are beautiful! Oh my goodness, both of these look awesome!! Wish I had a little (or a lot, lol) of these right now. I wouldn’t know where to start!! Pizza on the grill has to be the best what to make it, isn’t it? Thanks Dawn! Absolutely, pizza on the grill is the way to go! Pizza and salad are two of our favorite things! What a great combo of recipes! Thank you!